Watercolor created from a live specimen of Ocotillo, Fouquieria splendens, observed at Ninety-six Hills near Florence, Arizona, USA on 19 April 1993. At right in the thumb-link images is an emerald green lacewing egg. The tiny larva that emerges will patrol the surface of the ocotillo hunting small insects and caterpillar eggs. Despite being a champion survivor ocotillos also eventually die. The grubs of wood boring beetles make their way through the dead branches converting them to sawdust from the inside out. Click the thumb links for more information about these ocotillo associates. SHRUB: The unique and splendid form of the ocotillo is nearly as characteristic to the Sonoran Desert as is the Saguaro Cactus. A dozen or more arching spires, 3 to 5 meters long, spring upward from a basal crown, inspiration for another common name: The Coachwhip. 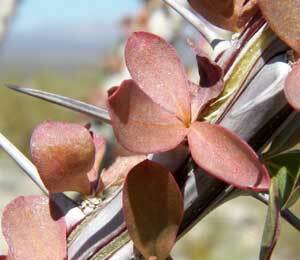 ARMED: The leaf petioles develop into very sharp 2 cm-long spines that cover the branches. You can see this succession by examining young leaves near the growing branch tip. LEAVES: Spatulate leaves are drought and cold deciduous, re-growing two or more times per year in response to ample rainfall and warmer temperatures. Spongy tissue in the branches and root crown can store water. This allows Ocotillos to remain green for many weeks following rain. FLOWERS: Long, tubular, coral-red flowers are borne at the tips of the branches and are favorites of Costa's, Black-chinned, and Anna's Hummingbirds. Blooms appear mostly March to early May, but may be found at almost any time of year. 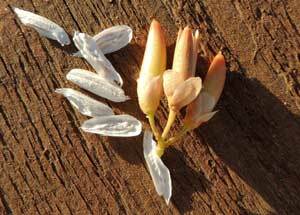 FRUIT: Dry, elongate capsules contain lightweight, winged seeds that are readily dispersed by wind; in the Sonoran Desert seeds are mature from May to June. Capsules are three-valved. RANGE: Characteristic plant throughout the range of the saguaro, but also ranging widely into higher elevations (up to 1500 m), westward into the Mojave Desert as well as eastward into parts of the Chihuahuan Desert. The arrival of White-winged Doves in the Sonoran Desert at the end of April coincides with the ripening of ocotillo seeds as well as the first really hot weather. These large birds alight on an ocotillo branch at the apex of its arch, then gently saddle out towards the limber and ever-slumping tip where the ripening seeds can be plucked from their capsules. Harris Antelope Squirrels, which are really ground squirrels ill adept at climbing, also ascend ocotillo spires to reach the same seeds. For both animals remaining perched on the branch becomes increasingly difficult as it wobbles about - each movement is amplified and the animal's attempts to extract the seeds scatter many of them into the wind. This interaction with seed predators over evolutionary time may partially explain the unique architecture of the Ocotillo. 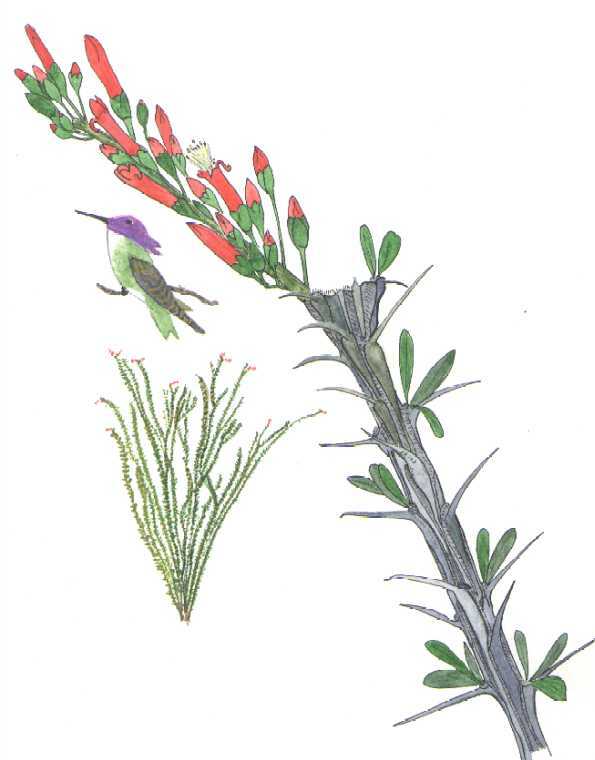 Costa's Hummingbirds also hold a close relationship with the ocotillo. The flowers are an important source of nectar which the hummingbirds pollinate. Lacewings may put their eggs on the ocotillo and the resulting larvae are voracious predators of caterpillars, insect eggs, and other soft bodied bugs.